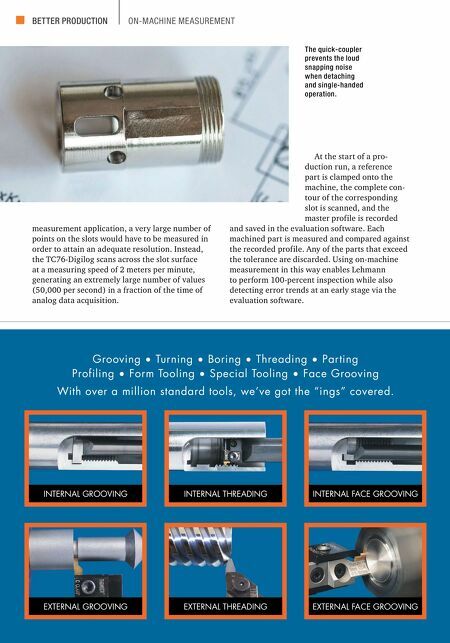 MODERN MACHINE SHOP 89 Scanning-Probe Process for Swiss-Type PROFILING PARTING SPECIAL TOOLING BORING DOVETAIL FACE GROOVING FORM TOOLING 888 - THINBIT • 888-THINFAX • THINBIT.COM Made in the U.S.A. Since 1964 data because the higher scanning force enables the probe to simply push through the coolant. It scans parts non-directionally, and measuring precision is attained via the Shark360 measuring technology, which introduces a face-gear measur- ing mechanism system to perform off-center probing. Mr. Lehmann notes that the company was close to having to refuse the quick-coupler order from Parker Hannifin until it devised the scanning probe pro- cess on the Swiss-type. In fact, it now uses this machine for other large production lots ranging from 10,000 to 30,000 pieces in mate- rials such as aluminum, stainless steels, heat-treatable steels and free-cutting steel. 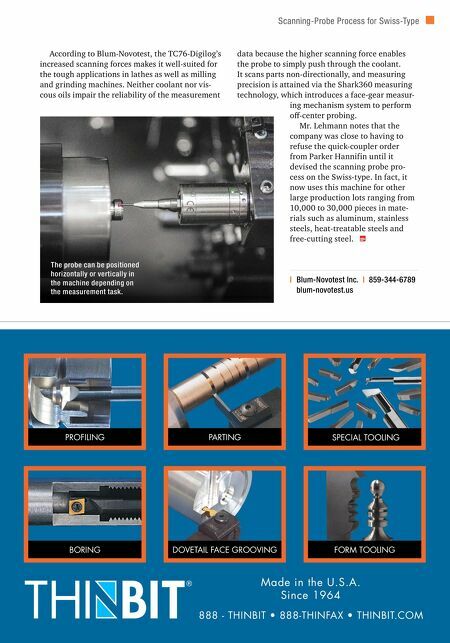 | Blum-Novotest Inc. | 859-344-6789 blum-novotest.us According to Blum-Novotest, the TC76-Digilog's increased scanning forces makes it well-suited for the tough applications in lathes as well as milling and grinding machines. Neither coolant nor vis- cous oils impair the reliability of the measurement The probe can be positioned horizontally or vertically in the machine depending on the measurement task.